October 25, 2018, 6:00 p.m.
Americans, whether Republican or Democrat, don’t like other countries interfering in US elections, but in the latest Economist/YouGov Poll, the parties differ on who, if anyone, is doing the interfering this year. For Democrats and independents, it’s Russia, but Republicans, like President Donald Trump, consider the Chinese as a more likely candidate to be interfering in the 2018 American midterms. 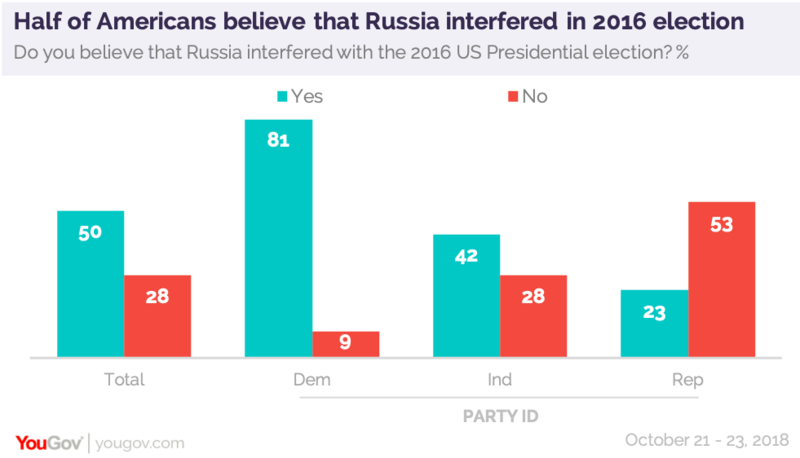 Democrats and independents are more likely to believe that Russia is attempting to interfere with the elections than to say China is doing that. Majorities of all political groups agree that it matters to them if other countries try to interfere with American elections. Overall, 61% say that would matter “a lot” to them. Just 13% say it wouldn’t matter at all. Independents, who tend to be less likely to vote than partisans, are most likely to say outside interference wouldn’t matter to them personally. 19% of independents say this. The partisan difference in these responses stems in part from how the public views the 2016 election, and Russia’s role in it, a role now being investigated by Special Counsel Robert Mueller. The Mueller investigation consistently has been viewed through a partisan lens. By two to one, the public overall believes there was Russian interference in 2016. But Republicans, by two to one, take the opposing view. The relatively small percentage of Republicans who do see election interference in 2016 are divided on whether or not that interference was meant to help Donald Trump win. In contrast, nearly eight in ten of all those who think there was Russian interference believe it was meant to help the President. Fewer than one in four think there was any interference in the presidential election by any other country. But the US isn’t blameless when it comes to election interference. By more than two to one, Americans agree that the US has in fact interfered with elections elsewhere. On this, Republicans, Democrats and independents agree.